O broccoli rabe, how I love thee! So biting, so bitter, so pungent...but oh so good. This is a stunning dish in both presentation and flavor...and oh so easy to make! 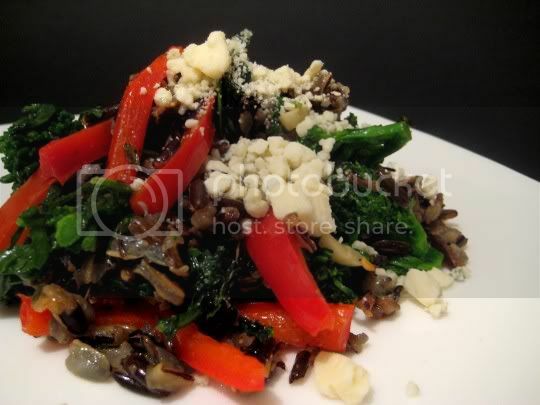 Simply cook wild rice (this is what takes the longest, about an hour, but you can basically forget about it as it cooks), then stir fry it with chopped broccoli rabe, red bell pepper, garlic, and spices. Every ingredient in this recipe works so well together: the bitterness of the broccoli rabe, the sweetness of the bell pepper, the nutty earthiness of the rice, the Italian flavor of the oregano and heat of the red pepper flakes. And then to finish it all off, stinky pungent Gorgonzola is sprinkled on top! What an amazing, amazing meal. The recipe suggests that this serves four, but this could easily serve only two hungry people...because it's so good and you'll definitely want to go back for seconds! Make again? Definitely. Broccoli rabe is quickly (and surprisingly) becoming one of my favorite vegetables.